I can’t believe that I have actually been doing this for 100 days! Phew! For those of you who are serious bloggers, I’m sure that doesn’t seem like much of an accomplishment, but for me- it’s a pretty big deal. I am very proud of myself for making it this far, and so excited to continue on! I’m not near done yet- I love doing this daily- and have learned so much in the past 100 days! I can honestly say this blog has changed my life- in many ways- and I thank you for being along for the journey. I love the asymmetrical hemline of this top! I also love the black and white with the splash of red. 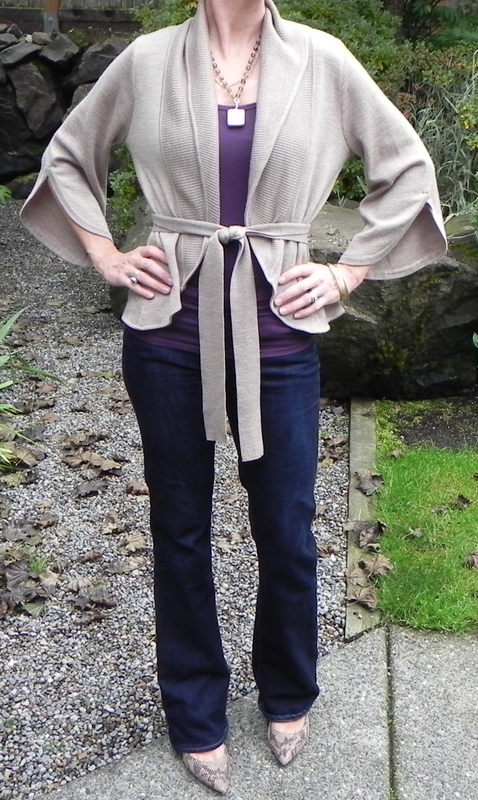 This tie front cardigan is perfect for hiding tummies! I called this look 'walking the dog'! I love the unexpected pink scarf! So simple and casual- yet with a hint of style. I LOVE this dress- love the pattern and love it paired with the black blazer. I would have never tried this with a turtleneck and tights before. I actually think this might be one of my all time fav's! Pretty simple, yet I really liked this outfit. 100 days of fabulous, Megan! You look incredible every day. Thank you so much! I love that just because I’m a mom (and over 40) doesn’t mean I have to give up on style. When you look good- you feel good! Can’t believe it’s been 100 days already! Congratulations! You’ve done an amazing job and you’ve looked great every day. 🙂 And I agree with Jodi – too many favorites to pick from. I get a smile on my face reading this. =). You are awesome Meg and love “seeing” you every day!! !